Hermes and Japanese photographer Hiroshi Sugimoto have teamed up for series of limited edition scarves inspired by Sugimoto taking long exposure shots of cinema screens. What ensues are vibrant and colorful photos with light passing through a prism. Sugimoto stays within his aesthetic of invisible horizons and mysterious parameters, although now with this project, color has entered his realm. These scarves really are meant for display as the impact is seen in whole, not in pieces around someones neck. Hermes selected 20 of Sugimoto’s Polaroids and printed them on silk scarves using ink jet printing. The collaboration is part of the Hermes Editeur series. 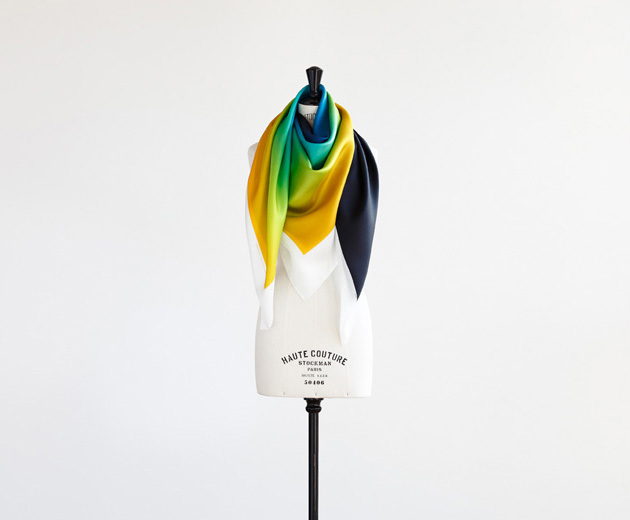 Each scarf will retail for around €7,000.0.